IDEAcarbon has been working on an initiative to i) explore the practical design for an international carbon reserve in a globally networked carbon market and ii) for the establishment of ratings driven exchange rates for carbon assets. This webpage has been created by IDEAcarbon to share and communicate thoughts on this important subject and make it inclusive of expert opinion. The World Bank Group formally requested IDEAcarbon to do an extensive study to evaluate the feasibility of these initiatives, propose a design & structure and review ratings’ readiness to support the design. This work is a reflection of the World Bank Group brief, but the ideas and concepts are those of IDEAcarbon. The World Bank’s task group on International Carbon Reserve is being co-led by IDEAcarbon and the World Bank. IDEAcarbon delivered its White Paper on the Design and Role of an International Carbon Reserve at the first World Bank Working Group meeting In Paris in September 2013. The design and concepts are IDEAcarbon’s concepts. IDEAcarbon’s work on these initiatives is led by Shandi J. Modi, has benefited from input and encouragement from the World Bank Group, and has drawn on the expertise of our Advisors and friends, including Professor Dr. Helmut Schlesinger (Former President of the Bundesbank), Nitin Desai (former UN Under Secretary-General), Lord Nick Stern (former Vice Chair, IDEAglobal Group), Bill White (chairman of the Economic Development and Review Committee at the OECD), Ian Johnson (Chairman of The Carbon Ratings Agency, President Club of Rome and former Vice President of the World Bank), Rupert Edwards (Managing Director at Climate Change Capital), Bob Litterman (Former Head of Risk at Goldman Sachs Asset Management), Michael Gallagher (former Head of Research, IDEAglobal) and John Davitt (former Head of Emerging Markets Research, IDEAglobal). It has drawn considerably from the vast relevant intellectual capital of The Carbon Ratings Agency. The White Paper and related recommendations do not necessarily reflect the views of any of the individuals who have reviewed this work. The starting assumption for this initiative is that trading across domestic emissions markets will lead to efficiencies, lowering the cost per tonne of CO2 avoided thus encouraging greater ambition. A "top down" global agreement would be the best solution and would likely lead to some level of harmonization across national systems, but is likely to take some time. In the absence of a global agreement, some countries and regions are voluntarily moving to develop carbon price mechanisms and NAMAs (Nationally Appropriate Mitigation Actions) at the domestic level. Most are interested in "linking" their markets formally and financing their NAMAs appropriately. To encourage this national and sub-national effort requires a credible, harmonized framework and comparability. However, generally, the picture going forward looks to be one of fragmented, heterogeneous markets. A globally-networked carbon market would be one way to facilitate trading across such markets in order to make markets more efficient and lead to a better price discovery. A globally networked carbon market could be achieved through the establishment of "exchange rates" and possibly a "reserve carbon currency" to support exchangeability and fungibility across “assets” of different types and from different countries. 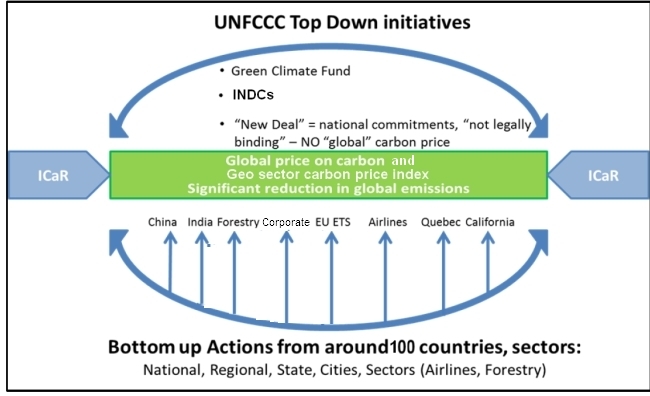 This is the subject of The IDEAcarbon White Paper entitled ‘The Role of an International Carbon Reserve in a Globally Networked Carbon Market’, which also makes the case for the creation of a reserve whose goals would be to provide forward looking price stability in the carbon market and to encourage a far greater level of investment and financial flows than would otherwise be likely. It is our view that implementing such a scheme could conservatively and realistically result in a significant increase to the current size of the market within three-to-five years, reduce costs of mitigation, and vastly improve environmental outcomes in size and integrity. Our White Paper is expected to be of interest to potential investors with an interest in developing and expanding future investment opportunities in the climate change and carbon markets space and to those committed to implementing a long term vision for a stable and scaled up carbon market capable of making a substantive contribution to reducing GHG emissions. Development of a Carbon Asset Rating Agency (CARA), an independent and credible rating system to inform ICaR's actions and those of other stakeholders of significance (private capital, corporations and the public sector). An International Carbon Reserve System (ICaR) to establish a credible long term "international price" and carbon asset exchange rates, thereby supporting domestic and international action and reduce volatility. This translates to potential “crowding in” long term private sector investors. Credible ratings are integral to the functioning of a Globally Networked Carbon Market and Reserve. Ratings must be credible, transparent, rigorous and comparable to other asset classes. The Carbon Rating Agency (CRA) has already built and tested a significant suite of rating capabilities to enable completion of ratings requirements in this structure.